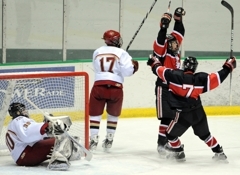 Centennial sophomore Hans Gorowsky had just scored the biggest goal of his life. 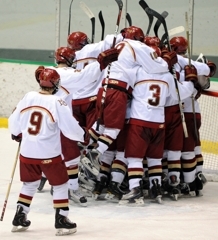 Naturally, Gorowsky was mobbed by teammates as the Cougars celebrated wildly against the glass. The light flashed behind the net, a referee signaled goal and Maple Grove goaltender Ryan Coyne leaned heavily on his stick as he stared blankly into the stands. Crimson forward Alex Mason skated dejectedly to the bench. At about that time, it all started to unravel for the Cougars. Maple Grove assistant coach Josh Hicks was insisting to Crimson head coach Gary Stefano the net was off its moorings when the puck went in. Stefano told Tyler Dunagan, one of Maple Grove’s co-captains, to relay the information to the officials. After talking to Dunagan, and conferring among themselves, the officials got a ruling from the goal judge. And if the goal had counted? “It definitely would have been a different mood on the bench, that’s for sure,” Mason said after the top-seeded Crimson rallied to beat Centennial 5-3 in the Section 5AA semifinals on Tuesday, March 1, at the State Fairgrounds Coliseum in St. Paul. Top-seeded Maple Grove plays No. 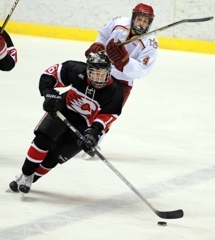 2 Blaine at 6 p.m. on Friday, March 4, at the State Fairgrounds Coliseum in rematch of last year’s section title game. “We were in trouble,” he said. “We hadn’t been down by two goals in two months. The last time was Eden Prairie, and that turned into a six-to-nothing game. Having dodged disaster, the Crimson, ranked fourth in the state in Class 2A, got goals from Tony Paulson and Mason in the final two minutes of the second to tie the score at 3. Paulson’s goal came on the power play, and Mason’s off a solo rush through the slot that left a Centennial defenseman spinning in his wake. 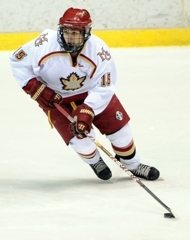 Mason scored again 1:09 into the third, and the Crimson (22-3-2) cruised to victory from there. Centennial (13-12-2) led 2-0 after the first period. Andrew Bertrand’s goal with 7 minutes left in the second gave the Cougars a 3-1 lead. Then came the goal that wasn’t a goal. “We talk about trying to control the things you can control, and we let that bother us,” Aus said. Junior Alex Mason scored two goals, including the game winner 1 minute, 9 seconds into the third period as top-seeded Maple Grove rallied to beat No. 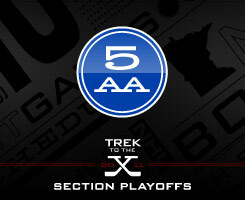 4 seed Centennial 5-3 on Tuesday, March 1, in a Section 5AA semifinal at the State Fairgrounds Coliseum in St. Paul. The Crimson (22-3-2), ranked No. 4 in the state, advance to the section final on Friday, March 4, for the second straight year. Mason scored the winner early in the third while on a rush with linemate Spencer Bell, who centered the puck from along the sideboards. 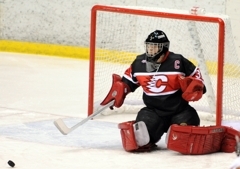 Mason, who was being hounded by a Centennial backchecker, managed to connect on a shot that eluded Centennial goaltender Brett Larsen. 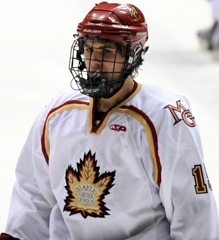 Maple Grove sophomore defenseman Jordan Gross added an insurance goal midway through the final period. 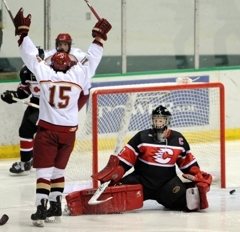 Maple Grove scored twice in the final 1 minute, 50 seconds to tie the score at 3. Those goals, by Tony Paulson and Mason, came just minutes after an apparent Centennial goal had been waived off because the net was ruled off its moorings. Paulson scored a power-play goal with 1:50 left in the second period to pull Maple grove to within 3-2, and then Mason had the large and loud Maple Grove cheering section roaring with a goal on an odd-man rush with 40 seconds left in the period. Andrew Bertrand scored midway through the second period to put Centennial (13-12-2) ahead 3-1. Maple Grove’s Bell had opened the scoring in the second period with a shorthanded goal. Trey Hughes scored early in the first period, and Riley Colvard scored late in the opening frame to give the Cougars a 2-0 lead. Both of Centennial’s first-period goals originated from the blue line. 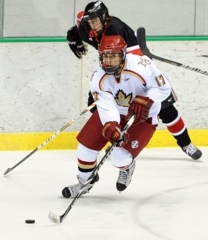 Hughes scored on a rebound of a low shot from the point by Cougars defenseman Max Zebro. Colvard was stationed to the left of Maple Grove goaltender Ryan Coyne when sophomore defenseman Andrew Bertrand fired a puck that was knuckling wide of the net. Colvard alertly got his stick on the puck as it reached the crease area and slammed it past Coyne. Coyne finished with 20 saves while Larsen had 26. The hard-rushing junior scored twice to bump his season goal total to 10. Both of his goals came on high speed drives to the net, and he flashed some soft hands in finishing both plays. A junior who skates with Mason on the Crimson’s second line, Bell scored a momentum-shifting shorthanded goal early in the second period and also did much of the gruntwork in setting up Mason’s two goals. The senior center scored in the first period, added an assist in the second and was a force both defensively and on face offs. He finished with a team-best six shots on goal.